I think this was my fourth year of entering the handspun class at the Rare Breeds Show at the Weald and Downland Museum in Singleton, so I must have been spinning for four years and two months and had my Ladybug wheel for nearly four years – it seems a long time since I started spinning! 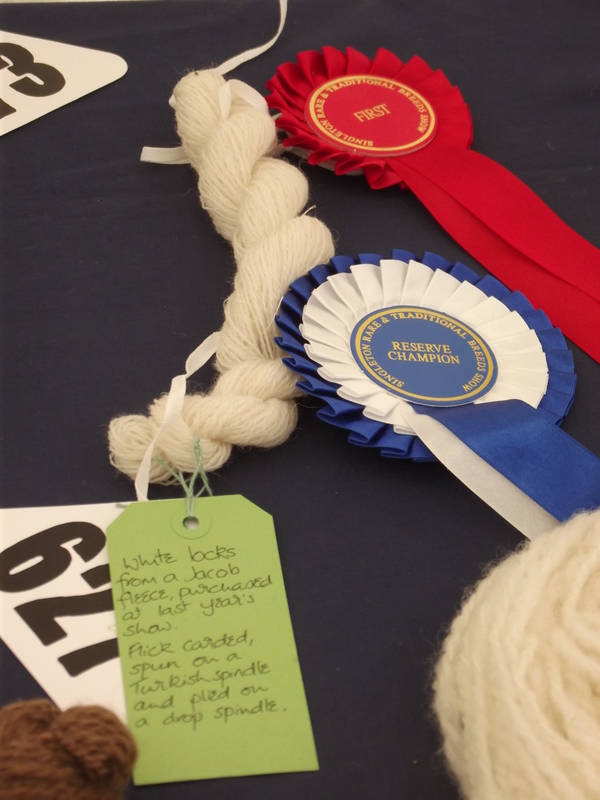 I had all sorts of plans for projects, but in the end I only entered two classes this year – but both projects attracted a rosette, and the white wool skein won First Prize and Reserve Champion (and a massive £5 in prize money)! I was going to add some more detail to the label about yardage/weight of the skein, but when I weighed it on my digital scales it came in at a massive 6g – certainly under the required limit of 50g – and I felt such a tiny weight made it look like I hadn’t bothered to spin enough!! 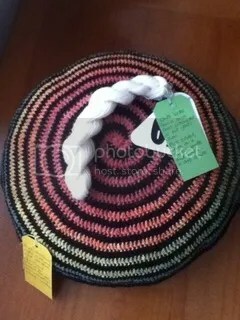 I finished the spiral project I blogged about last time and turned it into a cushion – that attracted a sixth place rosette. At least the weather was much kinder this year – a gloriously sunny day, instead of last year’s mud-bath. I will try and start planning projects earlier this year – I keep hoping to produce a huge circular shawl, but finishing it might be a lengthy process! Nice going!!! £5 bought me a Jacob’s fleece last year!!! Thanks – the fleece I used for the white wool cost less than the prize money, so it’s all good! !